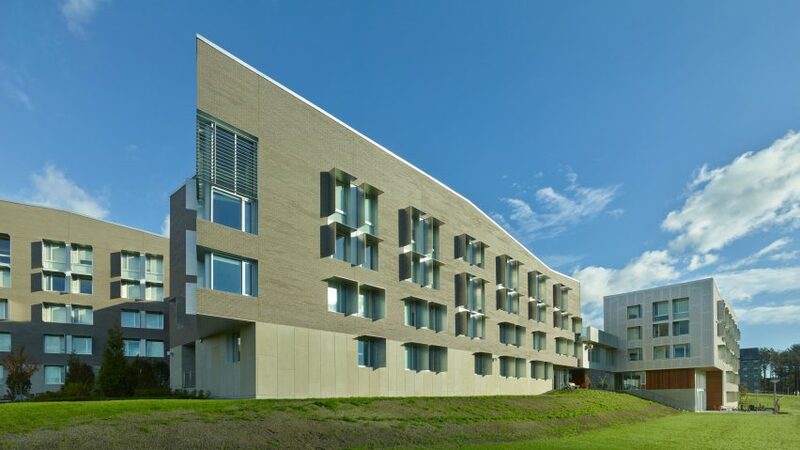 A cluster of brick-clad buildings with jagged roof lines form this student residential complex at Amherst College by American firm Kyu Sung Woo Architects. The Greenway Residences are located on the campus of the private liberal arts school, founded in 1821. The college sits within a scenic area of central Massachusetts characterised by forested, rolling hills. Consisting of four buildings on a 11.2-acre (4.5-hectare) site, the project serves as an initial step in a larger initiative to invigorate the eastern portion of the campus. The housing complex – totalling 110,000 square feet (10,220 square metres) – was designed to accommodate a diverse community, and to connect the university's past and future. The programme includes beds for 295 students, faculty apartments, multipurpose rooms and offices for student groups. The buildings – clad in Roman brick – are connected by elevated bridges and surround a central outdoor space. "The porous arrangement of the buildings allow for fluid movement and views through to various areas of the campus," said Kyu Sung Woo Architects, a studio based in Cambridge, Massachusetts. Rectangular in plan, the buildings have jagged roof lines, giving them a more sculptural appearance. The team utilised different facade treatments, with some walls sheathed in perforated screens while others have windows framed with metal solar shades. The terraced landscape features a wood-stepped amphitheatre, basketball courts and a barbecue patio. Inside, a range of apartment types were incorporated on each floor. Social areas – such as lounges, kitchens and yoga studios – are dispersed throughout the complex. A demonstration kitchen provides cooking workshop and can be reconfigured for catered events. Circulation and service cores were placed on the north side of the buildings, while apartments and social zones were located on the south. "The buildings are oriented to the south to benefit from solar exposure and allow for spectacular views to the mountains beyond," the architects said. To encourage walking, the team created stairwells with enlarged landings and windows that provide views outward. The complex has a number of sustainable elements, such as natural ventilation, LED lighting with bi-level switching and a radiant heating and cooling system. The team also added stormwater "gardens" and a rooftop rainwater collection system. Other student housing in the US includes a Chicago complex by Studio Gang that is clad in wavy strips of concrete and an apartment building by LOHA that steps down a hillside in Los Angeles. Landscape Architects: Michael Van Valkenburgh Associates, Inc. Interior Designers: Parker-Torres Design, Inc.